A hundred people showed up yesterday for a rally at Congressman Richard E. Neal's Springfield office on State St. We were there to see if we could win Neal's support for HR 676, The United States National Health Insurance Act. Rep. Neal has already met with 2-3 groups regarding his stance on healthcare, and can't keep spending time meeting with groups over this single issue. • Neal's position on health care is not clearly articulated in any public place and cannot be articulated without a "longer conversation" but unfortunatelty Neal is not available to meet on this topic for at least a month-and-a-half or two months in the future. • When asked whether Neal supports HR 676 or not, Powers stated that Neal takes issue with how HR 676 is written, but does not necessarily object to HR676. Again, his position on HR676 requires a "more lengthy discussion". Could Neal's lack of support for HR 676 be linked to the fact that his top contributer category is insurance companies? That's not the case for any of the other 13 U.S. Senators and Representatives in Massachusetts. Unfortunately it seems as if President Obama has yet to come around to supporting a true single payer plan. His current proposal gives too much power to insurance companies. A good fact check on his plan can be found at PolitiFact. A real problem is that his plan mimics the Massachusetts model. Yesterday's Boston Globe sees the state's health care costs spiraling out of control, waits for doctors increasing, and costs keeping patients from accessing prescription drugs and doctors. It's not too late to win HR676, but we have our work cut out for us. Photos: President of Arise Don James, Shirley McCready and John Bennett from Mass. Senior Action, Liz Bewsee from Arise and Ashley from OutNow, Arky Markham from Western Mass. Single Payer Network, Sadie Centeno and Vanessa Rivera from Arise, State rep. Ben Swan, City Council candidate Norm Oliver. Your life is never really the same after a vision like that. 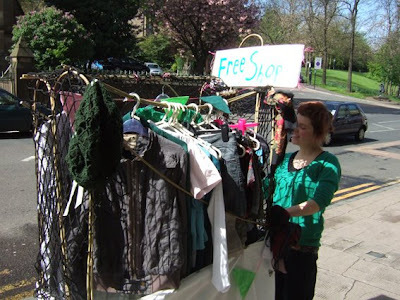 Kate Mackay: "we took to the streets with the free shop and it was an overwhelming success! 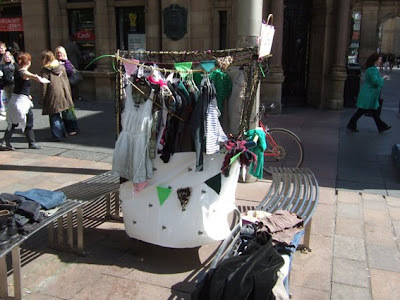 had loads of really great chats with people and gave clothes to some folk that really needed them as well as getting the shoppers of Glasgow to think at least a wee bit, we got rid of over 95% of what we took out which is fab!" continue the funding prohibition that dates from the 1980s. strategy," said Paola Barahona of Physicians for Human Rights. a denial of their basic human rights." in San Francisco and volunteers at a local needle-exchange program. looking to science in determining what we're funding." rates of infection among drug users." That comment was erased from the site recently. The link for this blog was sent by a friend. here is the link to the rest of the blog. Charity is a potency which in actualisation, perfects. If someone's love for you is truly unconditional and does not depend on what you are and what you do, what about you is truly being loved? I've been mulling about this for a few days and for the few of those that are interested in my thoughts here they are. When we think of love, we though our culture, are conditioned to think of it in a sentimental way. The feelings which are associated with love are pleasurable. The love we have towards our children, friends, partners and things is a positive experience, and we delight being in being in it's state. Couples who have drifted apart try to "rekindle" that feeling in order to draw themselves closer to each other. We associate love with a positive feeling which comes about as a result of existence of the beloved. Considered that way, in the absence of a beloved , there can be no love. In fact conceptualised as such, love is a second order phenomena; there must be a beloved before there is love. This however makes love a response, a reaction to something, a responsive sentiment. The object which elicits this sentiment usually is in possession of some excellence or good which we recognise and respond positively to. We may love a woman because of her beauty or character, our country because of its particular features, our friends because of their good natures, the love is always a consequence of some excellence in the beloved. Our beloved generates feelings in us which continue to be sustained in the presence of the beloved and since the feelings are pleasurable, we seek to maintain them. Should we loose our beloved, the ensuing deprivation grieves us and we seek the beloved return. It should also be apparent then devoid of excellences, a thing can be unlovable. A hideous man or woman elicits repulsion, a bad character, disgust and so on. Indeed our reactions to other things may be that of indiffernce or repulsion. 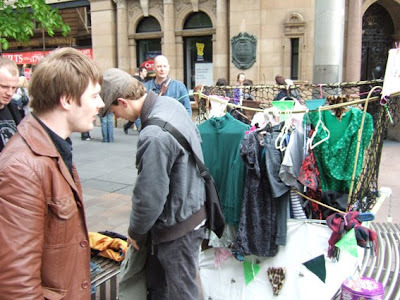 We pass people on the street and think nothing of them, we read about awful criminals and are revolted by their behaviour, not seeing any goodness in either we a devoid of the loving sentiment toward them and hence don't mourn their loss. Clearly then, love thus conceptualised, is a pleasureable sentiment elicited by the qualities in another. This type of love seeks is sustained by the pleasure elicited by another, it is sustained by hedonic satisfaction. Once the pleausure stops so does the love. When a couple say they have fallen out of love, what they are saying that they are not getting any pleasure from the existence of the other. The husband, whom the wife would at one time love with all her heart, farts in her presence, ignores her reasonable demands, is a brutish and boring lover and has grown a beer gut. There is nothing attractive about him, his character qualities are overshadowed by his repulsive nature; she loves him no more. His presence does not elicit pleasurable sentiments and at best she becomes indifferent to him and at worse is repulse him. 32"If you love those who love you, what credit is that to you? For even sinners love those who love them. 33If you do good to those who do good to you, what credit is that to you? For even sinners do the same. 34If you lend to those from whom you hope to receive, what credit is that to you? Even sinners lend to sinners, to receive as much again. In all the instances cited above the lover is getting a benefit from the loved, and clearly Christ thinks that that form of love is nothing special. What precedes that bit of text and what follows is Christ's idea of Love. ‘But I say to you that listen, Love your enemies, do good to those who hate you, 28bless those who curse you, pray for those who abuse you. 29If anyone strikes you on the cheek, offer the other also; and from anyone who takes away your coat do not withhold even your shirt. 30Give to everyone who begs from you; and if anyone takes away your goods, do not ask for them again. 31Do to others as you would have them do to you. Now clearly in these two passages the type of love that Christ is taking about is a love that gets no pleasure from the object of its attentions. In fact that lover may be repulsed by the beloved but the lover still wishes good to the beloved. For years I interpreted this text as meaning one must do good and have pleasant sentiments towards the wicked, but I was wrong; my feelings while performing good works don't matter. The basis of Christian love is asentimental. This has profound consequences for our understanding of Christian love. Unlike hedonic love which is a second order phenomena, Christian love is a first order effect, it exists prior to the existence of the beloved and independent of the nature of the beloved. Christian love is the intent of perfection manifest in self, others and the world. More importantly it can't be seen as a sentiment or a feeling, but rather a perfecting "force" present in Christian nature. When Christian love is actualised it is directed towards the perfection of its object regardless of how the actor feels about the object of his actions. Christian love is the force that can love what gives us no pleasure. So when Tom asks what is unconditional love? The Christian replies it is what I give to you(even under sufferance), not what you give to me. To the pagans this concept would have been ridiculous.